Since taking a 1999 sabbatic leave in India, Kathryn Myers‘s small-scale observational paintings have been richly informed by Indian life and culture. At Bose Archives last month, she recalled how she fell in love with the art and people of this huge, colorful dempcracy. Myers has enthusiastically curated numerous exhibitions of contemporary Indian art, and in 2011 she began working on a series of video interviews with the artists, now available on her new website, Regarding India. The following is an excerpt from the Bose interview. Kathryn Myers, Correspondence, oil on wood, 7 1/2 x 16 inches. “Growing up in Chicago and attending college (St. Xavier) and graduate school in the Midwest, (UW-Madison) I had no particular exposure to Indian art and had not traveled at all outside of the Midwest. 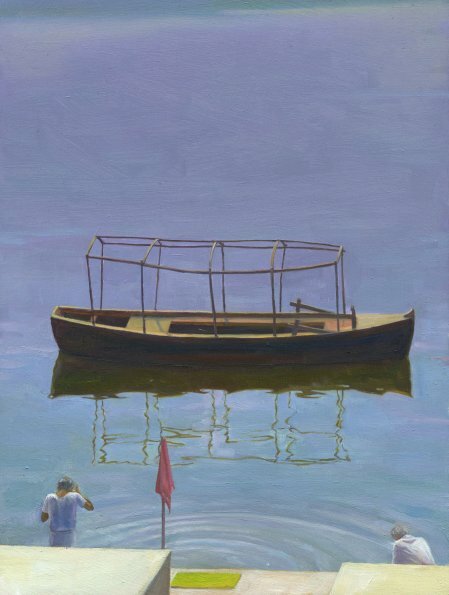 My main focus was on the contemporary gallery scene in Chicago which was the closest one to me at the time, and then New York when I moved to the east coast to teach at the University of Connecticut in 1984. As I traveled to Europe on different artist residencies in the 90’s I came to know more about contemporary European art. “I went to India for the first time in 1999 on a sabbatical leave from my university and I stayed at two artist residencies, The Kanoria Centre in Ahmedabad and Sanskriti Kendra in New Delhi, each for a month and traveled for a month between. I did not know much about India at all, maybe a minimal amount about miniature painting, I had never seen any Indian art in person that I remember, so I was very naïve and uninformed and thus probably also very open to wherever the experience might take me. Everything from activity on the streets, the regional diversity of Indian geography, food, popular culture, religion, architecture and national and local politics was a revelation. I veered between moments of ecstasy and despair and many feelings in-between, nothing had ever in my life produced such strong and constantly shifting emotions. I came to love the old city of Ahmedabad in particular and have visited many times since to visit close friends. From Delhi I traveled all over Rajasthan and also to Khajuraho and Varanasi. (Varanasi remains my favorite city in India). I loved seeing art in all of the museums. Aside from Folk art I was drawn to miniature painting and work that I will describe as “diagrammatic or ritual” from Jain traditions as well as tantric cosmology diagrams etc. 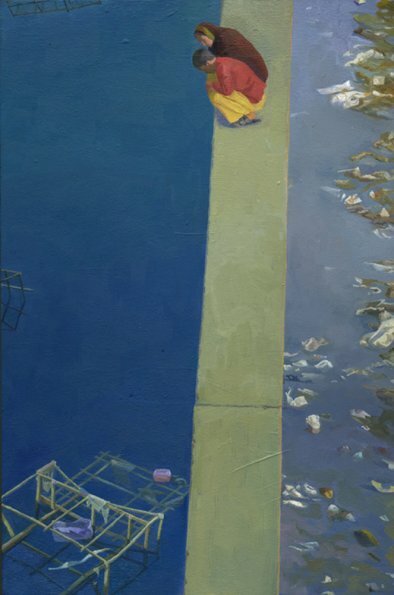 Kathryn Myers, Sabarmati Divide, oil on wood 7 x10 iches. “I also had in 2002 an amazing opportunity to curate what turned out to be a very large exhibition of Indian art, titled “Masala, Diversity and Democracy in South Asian Art” at our university museum, the Benton Museum of Art, I worked on that for several years and it opened in 2004. It was as someone described a “crash course in Indian art” and was reviewed by Holland Cotter in the NY Times and in Art India magazine. It introduced me to many artists in the Diaspora, including two artists who co-curated two sections of the show, photography, Annu Matthew and art of the Diaspora, Siona Benjamin. Bose Pacia loaned most of the contemporary work and it was through Bose Pacia that I really came to know and appreciate contemporary Indian art. “To continue the sense of synergy at that time, UConn also started a new India studies program for which I served on the board. It was then that I created my new course Indian Art and Popular Culture. This course allowed me to organize what I had been learning on my own in a form and structure that would allow me to share my love of Indian art with my students. “My interest in contemporary art came later. When I first came to India, aside from hearing about and then meeting with Peter Nagy, from Nature Morte Gallery in Delhi, there was not much that was accessible to me about contemporary art and I was much more interested in miniature painting and folk art, types of art that many artists who travel to India are initially drawn to. My interest in contemporary art started during my Fulbright in 2002 when I was meeting art professors and students and it was through these personal connections that I developed an interest in researching Indian contemporary art….” Read more. Kathryn Myers’s work is currently on view in exhibitions at Aurodhan Art Gallery, Pondicherry, and Galeria De Belas Arts in Goa, India. Myers is a professor in the department I happen to be enrolled in at the University of Connecticut. I love her work and have been able to even give tours and talk about it in our art museum. I've also written two papers about her work, I love it! !